The first of six to be built at the yard, the RSS Valour will be fitted with Harpoon missiles, an OTO Me- lara 76-mm rapid firing gun, torpe- does, sonar, surveillance and fire control radars and other sophisti- cated electronics which make up a complete weapon system. USNS Capella (T-AKR-293) and the USNS Antares (T-AKR-294). The contract performance period is five years, beginning July 22, 1989. Hampton, N.H., an industry leader in the design and installation of dehumidification, sealing and moni- toring systems for the marine market, is offering a free six-page fold-out brochure titled "The Com- plete Marine Dehumidification Ser- vice." The publication discusses L&C's complete marine dehumidification service that keeps vessels in lay-up shipshape and ready to reactivate. L&C's passive rather than active lay-up method reduces labor and energy costs because a dehumidified vessel in passive lay-up can be left unattended. C/H field since 1939; dry air distri- bution to designated controlled spaces around the vessel; control alarm and monitoring system that includes a series of humidistats and humidity-recorders strategically placed throughout the vessel to con- trol and monitor the humidity level in all controlled spaces; and the Pro- tective Sealing System, a durable strippable vinyl plastic seal provid- ing a weather resistant, tough and seamless skin that will last the dura- tion of the lay-up. 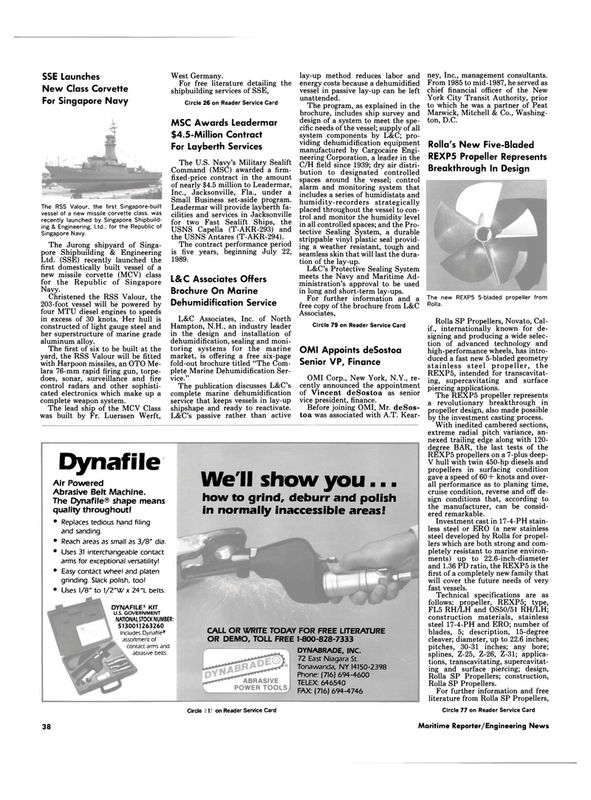 L&C's Protective Sealing System meets the Navy and Maritime Ad- ministration's approval to be used in long and short-term lay-ups. OMI Corp., New York, N.Y., re- cently announced the appointment of Vincent deSostoa as senior vice president, finance. The Dynafile® shape means quality throughout! • Replaces tedious hand filing and sanding. • Reach areas as small as 3/8" dia. • Uses 31 interchangeable contact arms for exceptional versatility! • Easy contact wheel and platen grinding. Slack polish, too! • Uses 1/8" to 1/2"W x 24"L belts. We'll show you... how to grind, deburr and polish in normally inaccessible areas! DYNABRADE, INC. 72 East Niagara St.
FAX: (716) 694-4746 ney, Inc., management consultants. Marwick, Mitchell & Co., Washing- ton, D.C.
REXP5, intended for transcavitat- ing, supercavitating and surface piercing applications. V hull with twin 450-hp diesels and propellers in surfacing condition gave a speed of 60+ knots and over- all performance as to planing time, cruise condition, reverse and off de- sign conditions that, according to the manufacturer, can be consid- ered remarkable. Investment cast in 17-4-PH stain- less steel or ERO (a new stainless steel developed by Rolla for propel- lers which are both strong and com- pletely resistant to marine environ- ments) up to 22.6-inch-diameter and 1.36 PD ratio, the REXP5 is the first of a completely new family that will cover the future needs of very fast vessels.